Ecozz EcoShopper, the original reusable foldable quality carrier bag of 100% rPET. The Gold Edition: a magnificent collection of masterpieces on our original ecoshopper. Bright, full colors and authentic details. 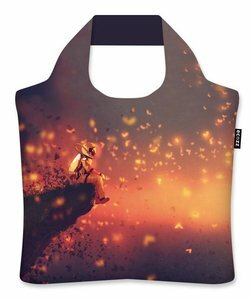 Ecozz Original EcoShopper Gold Edition, inspiring masterpieces from well-known Masters - full color down to the smallest detail - on our original reusable foldable quality carrier bag of 100% rPET. A real Must-Have. The zippered Ecozz shopper is a well thought-out trendy classic with all modern features that a shopper must have: a zipper that protects the contents of the bag, stitched on the hem for extra carrying capacity, as strong as 4 plastic bags, washable thanks to the unique printing method, wide handles for extra comfort and especially durable due to the unique material!